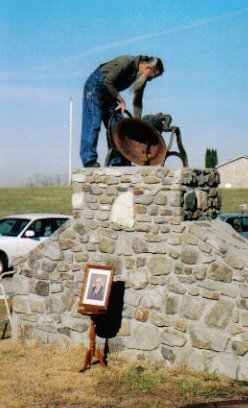 The historic bell that once rang in Cades Coveis being used again as it did many years ago! An Historic bell once rang in a Cades Cove church tolled Tuesday in honor of Mildred T. Bardill, who died Friday. Lendel Abbott of Chilhowee View community tolled the bell 82 times in honor of each year of the life of his deceased cousin. Twenty-five family members and spouses gathered to honor Bardill on the Abbott farm off Abbott road in Maryville. "This old bell was bought by Daniel Byrd (D. B.) 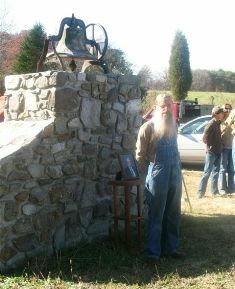 Lawson, who lived in Cades Cove after he fought in the Civil War. He was a Confederate soldier. After his discharge he returned home to Cades Cove and built the Hopewell Methodist Church" said Abbott. Lawson was his great-grandfather. The Hopewell Church was located near the Dan Lawson place in the cove. Like other Cades Cove families, the residents were forced out when the Great Smoky Mountains National Park was established. 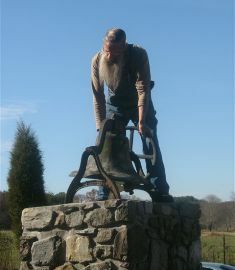 Abbott and his father rescued the bell, which was made in Hillsburro, Ohio. "We were at a decoration in the park and the bell was laying on the ground beside the church. My daddy, Slick Abbott backed his old A-model Ford car up and we loaded that bell in the trunk of the car and hauled it home. My daddy said "this will be some history the Park Service will never get," Abbott recalled. He thinks this was in the mid 1940'S. 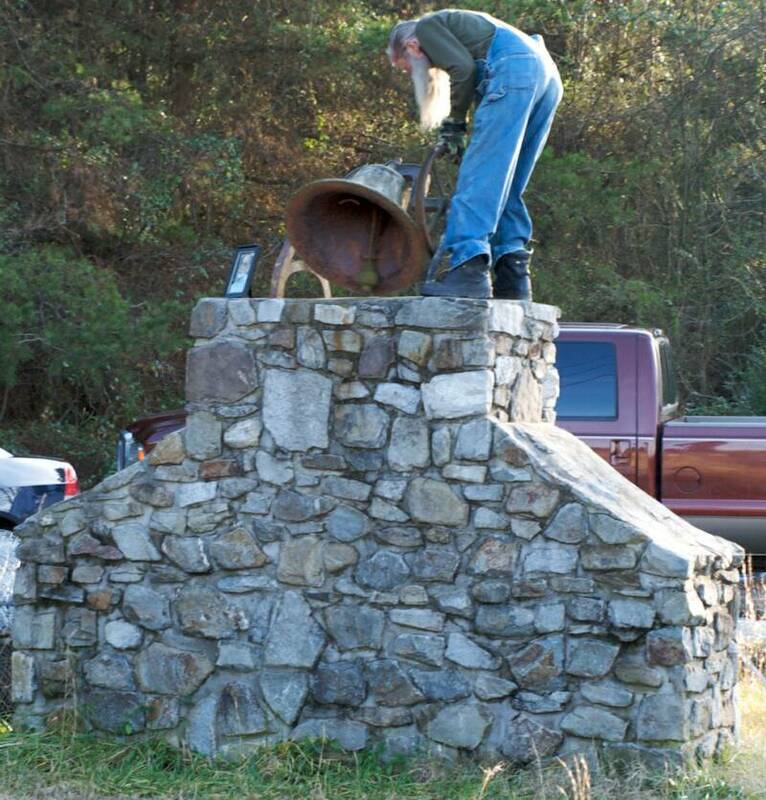 "After that time, the Park Service burned the old church," Abbott said "I am glad this old church bell was saved before it was destroyed"
"The bell laid in our back yard for years and years" Abbott said. His mother requested before she died that he build a stand for the bell "in honor of all the folks that have passed on in death." The family farm was divided up between the children and Abbott erected the bell at the location on the farm where the different sections touch. Abbott gathered rocks from Old Cades Cove Mountain Road. "I got as close as I could without getting on the Park to get them, "he said. It took him 60 hours to erect the 61/2 foot tall,10-foot long & 2 foot wide structure. It is built like the end of a church. "This old bell has been tolled many times in honor of people who have passed on in death, "Abbott said, "Bells have carried messages for hundreds of years. When bells were tolled, members of the community halted what they were doing and counted the number of times the bell tolled. If you knew somebody in the neighborhood was real sick, you would know who died by the number of times the bell tolled," said Abbott's cousin Dale Tipton. Bardill's brother, Don Tipton and Abbott first rang the bell, then Abbott tolled it 82 times. When the bell is tolled the clapper hits only one side of the bell. "It was sad when it rang one time," Abbott referring to the death of a baby. "As long as I am able, I will continue to ring and toll this old bell for anyone who passes on in death. This bell will sit in silence from now until another family member or some other person dies, "Abbott said. After tolling the bell, the people attending the event were led by Don Tipton in singing "Amazing Grace." Lee Roy Coada was born on January 3, 1924 in Cades Cove to John and Janie Cable Coada. He was my hero and role model, faithfully and steadfastedly holding true to beliefs and values in a manner which most of us can only begin to approximate. Roy was faithful and true to his faith, his family, his country, his neighbors and his ancestral heritage. His life was one of faithful and consistent service and sacrifice. It is said that a person’s reputation is based on what they do rather than on what they say they will do. Roy’s legacy is a reputation which is immense. Roy and his beloved Roxie were charter members of the CCPA. Roy served on the Board of Directors since it’s inception in 2001 and both he and Roxie faithfully attended Board meetings and provided guidance and inspiration as long as health and circumstances permitted. Roy was the “heart and soul” of the CCPA. He was always available to pound nails, sand floors, paint, trim bushes, make “buzz saws” and care for the Cove cemeteries. As his health deteriorated, Roy, even if he shouldn’t have done so, showed up to lend advice, encouragement and a helping hand. It was very difficult to keep Roy in his “supervisor’s chair” while work was underway! Roy was true to and proud of his Cove heritage. He enthusiastically shared his love and knowledge of Cove family and community at Old Timers Days, Cove church services and on any occasion when requested. Before the CCPA was established, Roy maintained the resting places of his ancestors at the Cable Cemetery, maintaining fencing and grounds. He shared his knowledge of his genealogy with others willingly and proudly, contributing significantly to preservation of that heritage for generations to come. Roy left us on November 12, 2007. Our fond memories and gratitude for what Roy has contributed remain. Cove tradition is that those who lived lives of faithful service and contributions for benefit of their faith, family, neighbors and community were identified as “Uncle” or “Aunt”, independent of any “blood” lineage. These included Uncle Noah and Aunt Sarah Burchfield, and Roy’s beloved Aunt Becky Cable. 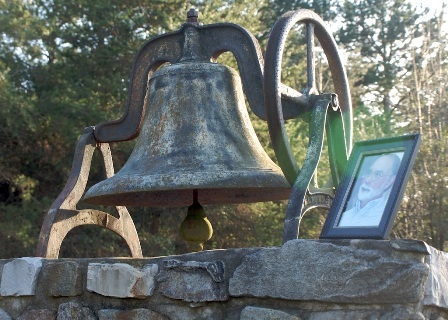 Today, Lendel tolls the old Cades Cove bell out of respect and love for a son of the Cove who has truly earned the privilege to be remembered as “Uncle” Roy Coada. He was our hero! Before bell tolling began as friends remembered Roy Coada and what he meant to us.